The Kapil Sharma Show will air every Saturday and Sunday at 9:30 pm on Sony Entertainment Television. Kapil Sharma is back with The Kapil Sharma Show. Kapil Sharma is back on Sony Entertainment Television with a brand-new edition of The Kapil Sharma Show. Starting December 29, The Kapil Sharma Show, produced by Salman Khan Television and Banijay Asia, will air every Saturday and Sunday at 9:30 pm on Sony Entertainment Television. In the latest season of The Kapil Sharma Show, Kapil Sharma will be seen running a ‘Salha Center’ (consultancy business) in a mohalla with absurd characters. The wealthy dairy kingpin Bachcha Yadav (Kiku Sharda) with his dominating wife Titli Yadav (Bharti Singh) have rented out houses in the same mohalla. To avoid rent, Kapil has made Bachcha his business partner. The other tenants in the mohalla are played by Chandan Prabhakar, Krushna Abhishek, Sumona Chakravarti, Rochelle Rao and Edward among others. 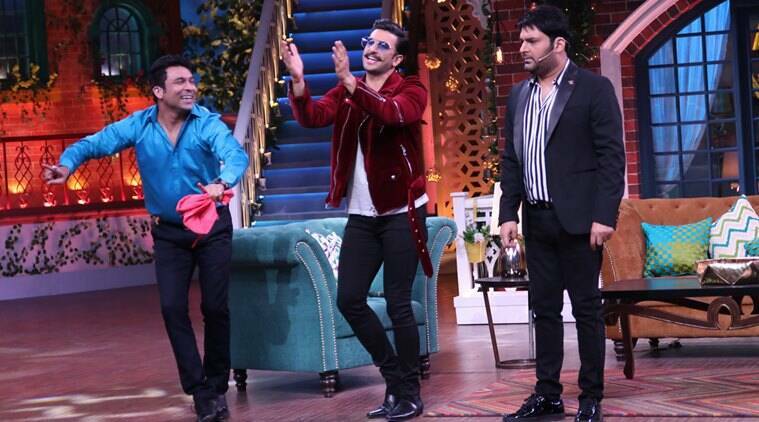 The first episode saw Ranveer Singh and Rohit Shetty grace the stage of The Kapil Sharma Show. Follow all the latest updates about The Kapil Sharma Show. The Kapil Sharma Show ends on a high note. Simmba actors Sara Ali Khan and Sonu Sood wll enter The Kapil Sharma Show on Sunday. Kapil Sharma welcomes Simmba director Rohity Shetty. The filmmaker remarks all the sequels are his FD for old age. Chandan Prabhakar dedicates Ek Jaan Hain Hum song "Yaad teri aayegi mujhko bada satayegi" to Kapil Sharma. Chandan Prabhakar is back. He takes a dig at Kapil Sharma’s earlier fondness for Ranveer Singh’s wife Deepika Padukone. DeepVeer's wedding dominates the conversation on The Kapil Sharma Show. Vatsal Sheth tweeted, "Watching #KapilSharmaShow just can’t stop laughing 😂..Thank you @KapilSharmaK9 for the much needed laughter therapy @SonyTV"
Kapil Sharma tags Ranveer Singh and Deepika Padukone as the most beautiful couple. Kapil Sharma is not happy that Ranveer Singh is on The Kapil Sharma Show. The comedian is heartbroken as Ranveer married his former crush Deepika Padukone. Kapil Sharma welcomes Simmba actor Ranveer Singh. The actor makes a grand entry. Kapil Sharma's frenemy Krushna Abhishek enters The Kapil Sharma. Krushna hints at their past rivalry. Sumona Chakravarti enters as Bhoori. Bhoori is the sister of Tijori Devi. Sexist jokes dominate the first episode. Guess somethings never change on The Kapil Sharma Show. Bharti Singh enters as Titli Yadav. She plays the wife of Bachcha Yadav. Kiku Sharda enters as Bachcha Yadav. Chandan Prabhakar and Kapil Sharma take jabs at each other. The exchange went on for quite some time and turned irksome. Chandan Prabhakar arrives on the stage of The Kapil Sharma Show. A girl in the studio audience asks Kapil Sharma for marriage advice. He offers advice but does not miss the chance to flirt with the girl. Kapil Sharma cracks jokes about unemployment. He takes a dig at those who offer advice. Kapil Sharma welcomes Navjot Singh Sidhu. The former cricketer has already started with his Sidhu-isms. Kapil Sharma kicks off the latest season of The Kapil Sharma Show. The studio audience cheers him on shouting, "Kapil, Kapil, Kapil". "I have had a successful innings with Sony Entertainment Television and I am excited to come back with a brand-new season of The Kapil Sharma Show. I am humbled by the love and support of the audience and I am looking forward to the same this time around as well. All the artistes who are associated with the show Chandan Prabhakar, Kiku Sharda, Bharti Singh, Krushna Abhishek, Sumona Chakravorty, Rochelle Rao and Edward are more than just my colleagues. They are friends and family. My relationship with them is a long standing one. The year is ending on a high note for me both personally as well as professionally," Kapil Sharma said in a statement. "I am happy to announce my foray into television production with the launch of India’s most celebrated comedy show - The Kapil Sharma Show in association with Banijay Asia. I am delighted to associate with Sony Entertainment Television for my first TV venture. Nadim Qureshi - Founder and Managing partner of SK TV and I are committed to deliver quality content that entertains and unites families," Salman Khan said in a statement. Talking about The Kapil Sharma, Danish Khan, Business Head, Sony Entertainment Television, said, "Kapil Sharma is back on Sony and it’s a New Year gift from our end to our viewers. We are delighted to bring back India’s favorite comedy show. This season is produced by SK TV and Banijay Asia and they have done an excellent job. I am certain this season of The Kapil Sharma Show will surpass the success of the previous seasons."